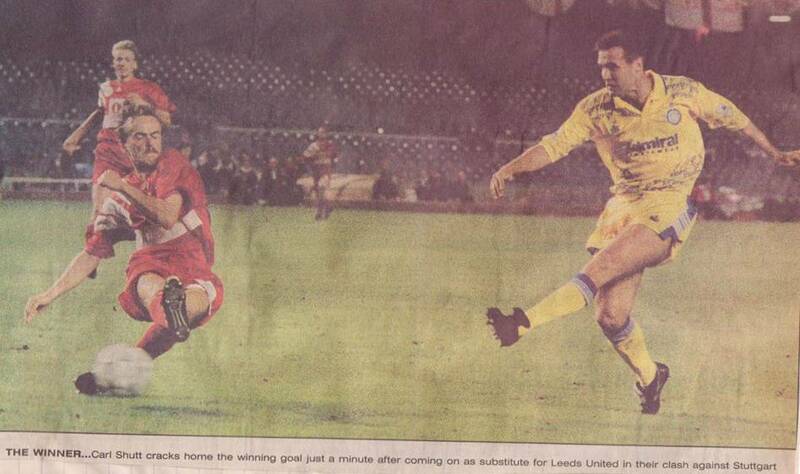 Date: Friday, 9th October 1992. Venue: Nou Camp Stadium, Barcelona, Spain. Competition: European Cup First Round Replay. 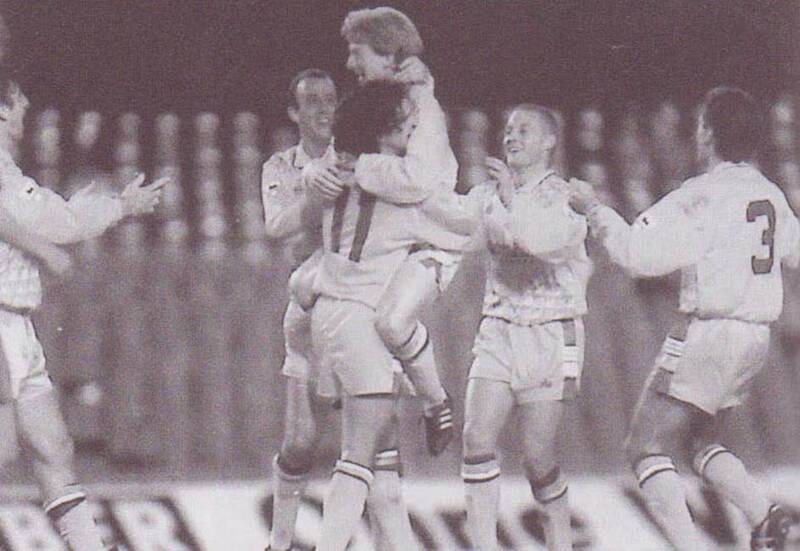 Scorers: Leeds United: Strachan, Shutt. 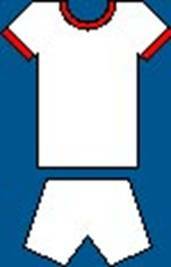 VfB Stuttgart: Golke. 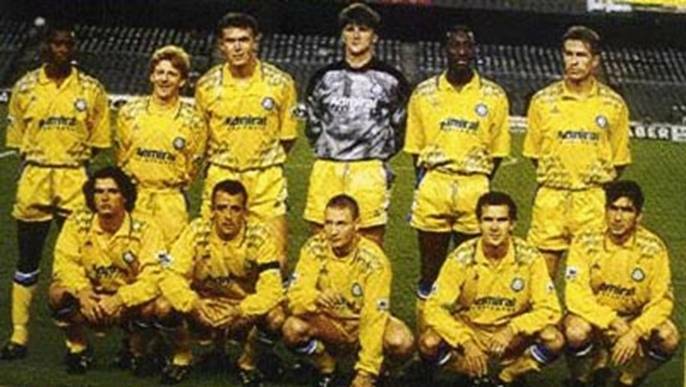 Leeds United: Lukic; Newsome, Dorigo; Batty, Fairclough, Whyte; Strachan (Rocastle), Cantona (Shutt), Chapman, McAllister, Speed. 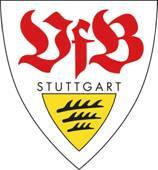 VfB Stuttgart: Immel; Schafer, Frontzeck; Dubajic, Strunz (Strehmel), Buchwald; Buck, Sverrisson (Knup), Walter, Golke, Kogel. 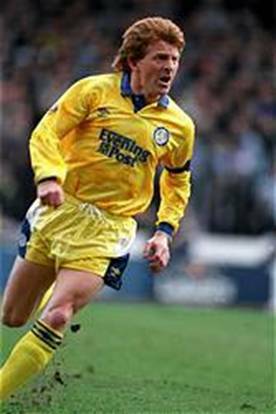 After the incredible fight back by Leeds at Elland Road no one realized that there had been an anomaly by the German coach in the use of his foreign players as substitutes. It emerged that Stuttgart had breached the tournament rules by using four 'foreign' players, rather than the three allowed. UEFA awarded the game to United 3-0 which left the clubs level on aggregate at 3-3 and decreed that a play-off game should take place in Barcelona. 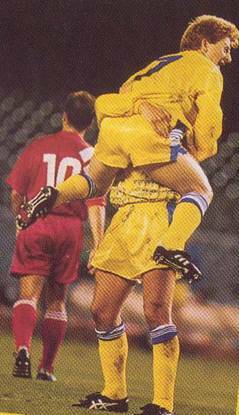 Now having a second chance, United were no going to pass it up easily, and the lined up in an almost empty Nou Camp Stadium in Barcelona in front of an estimated 10,000 crowd in a 120,000 capacity stadium. The game was played in an eerie atmosphere with United's travelling support situated in a small section of the upper tier of one stand. 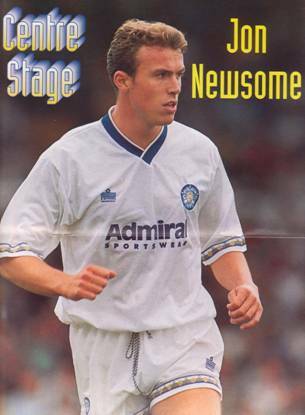 Jon Newsome had recovered from injury and returned at right-back with David Batty reverting to his usual midfield role. 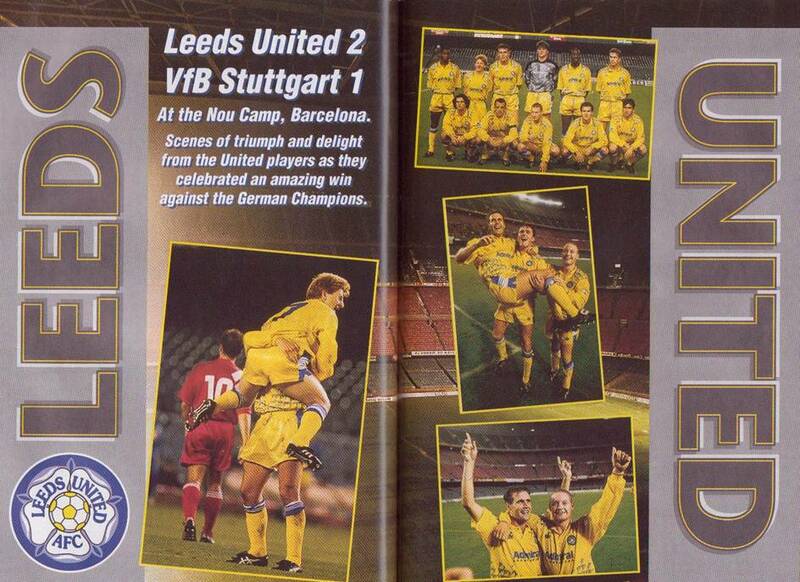 Super-sub Carl Shutt fired himself into Leeds United folklore with the winning goal against Stuttgart at the Nou Camp. Extra-time was looming when Shutt, thirty-one years old the previous Saturday, came off the bench to earn United a birthday bonus. 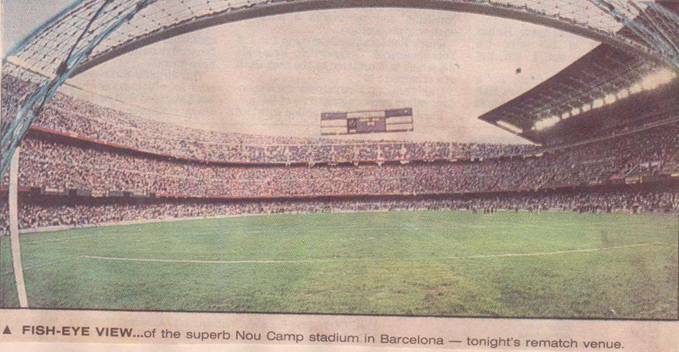 Only seven thousand four hundred were in Barcelona’s vast Nou Camp bowl to see United triumph 2-1. 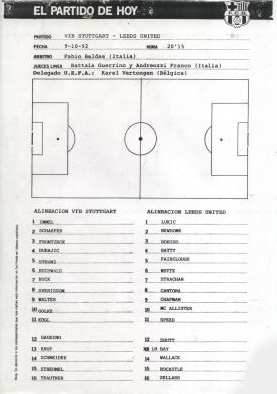 Most were curious local school children, who had been let in free, but an estimated two thousand five hundred Leeds fans were present in Catalonia. This was remarkable considering that the match was arranged at such short notice. 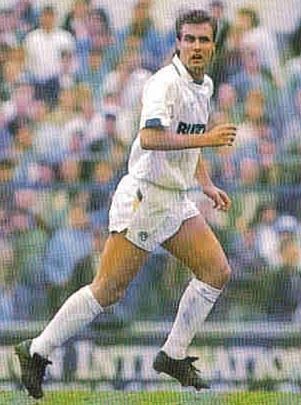 As UEFA had ruled the tie to be a category A match, the same reason why they had trimmed the capacity at Elland Road, saw thousands of Spanish police and Barcelona officials on duty to oversee just a handful of fans. 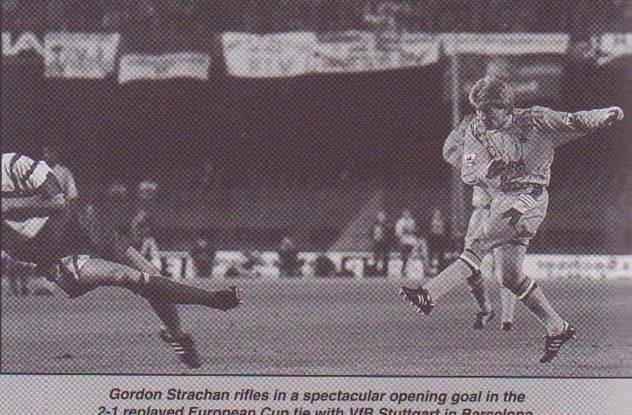 In a controlled opening United seized the initiative with a cracking twenty-five yard effort from skipper Gordon Strachan. 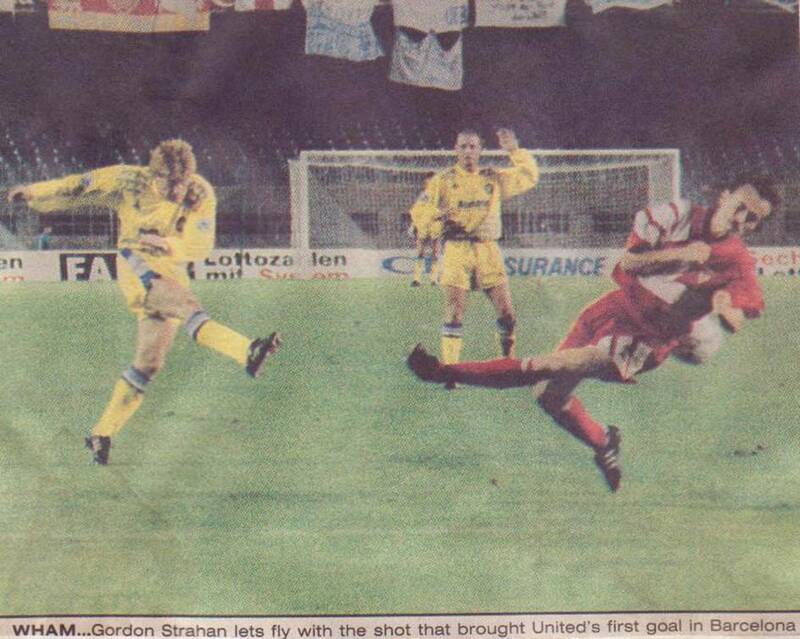 United’s lead only lasted seven minutes, as Stuttgart midfielder Andre Golke headed home Alexander Strehmel’s low centre and the match remained deadlocked until fifteen minutes from time when Howard Wilkinson made an inspired substitution. 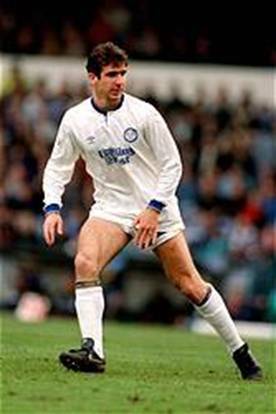 Carl Shutt replaced the ineffectual Eric Cantona and within sixty seconds he was back defending a corner. 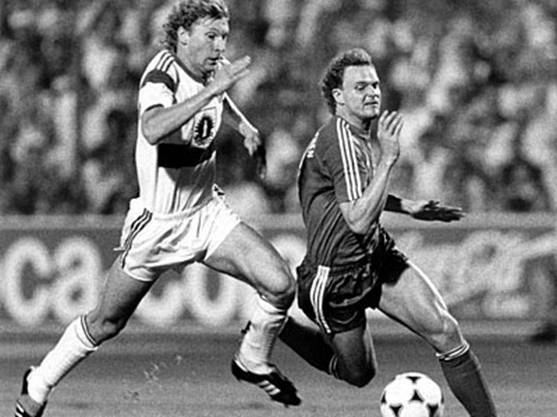 It was Shutt that charged down Andreas Buck’s attempted cross and headed the ball to Tony Dorigo and moved up in support, racing towards the Stuttgart goal. 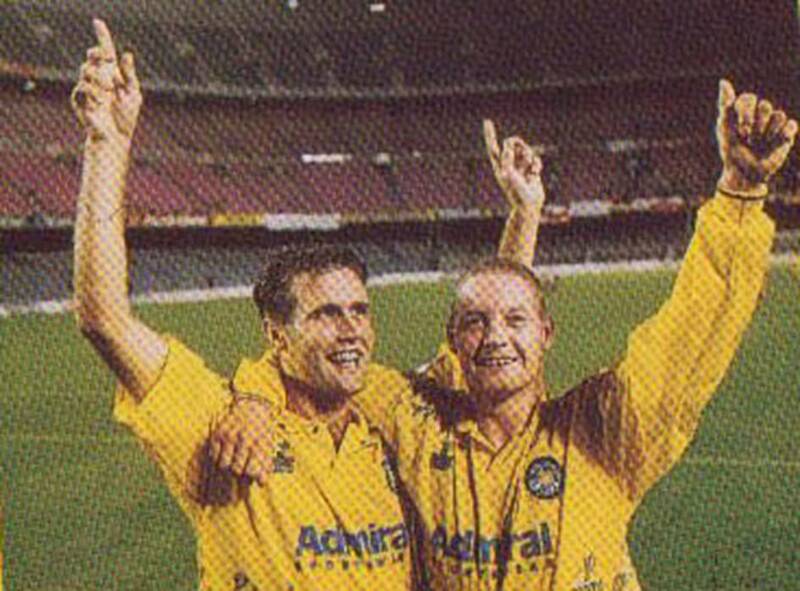 The Australian full-back played the ball into space ahead of the on-rushing Shutt who controlled it before gliding past Gunther Shaefer and firing home an angled drive to claim the winner on a glorious night for Leeds United. 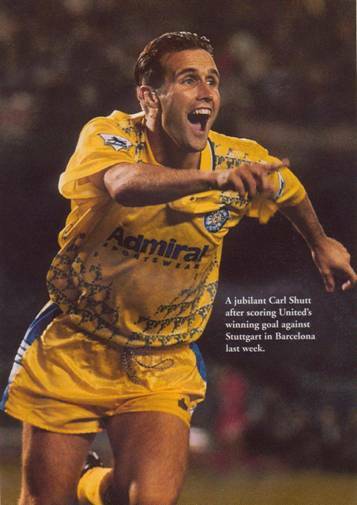 Carl Shutt remembered the occasion well. "It was a great night," he said. "There weren't many fans but they made a lot of noise and it was great to reward them." The stunning victory set up “The Battle of Britain” against Glasgow Rangers, who were hailed as one of the best-ever sides to come out of Scotland. 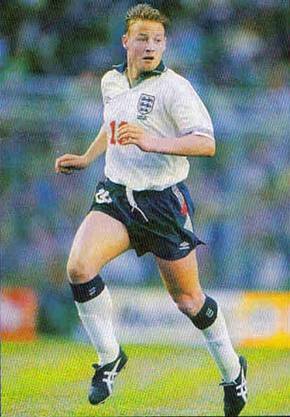 Back Row: Chris Fairclough, Gordon Strachan, Jon Newsome, John Lukic, Chris Whyte, Lee Chapman. 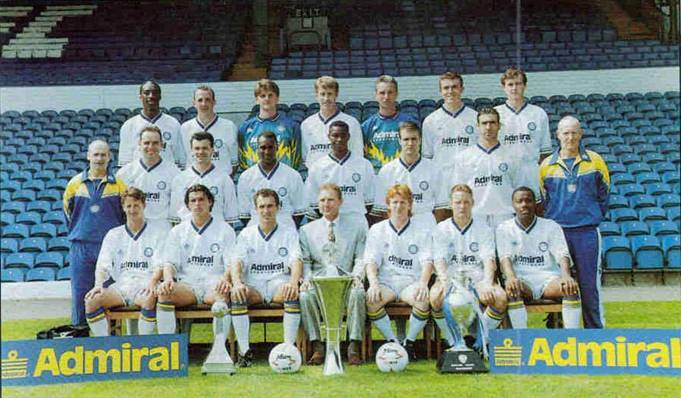 Front Row: Gary Speed, Gary McAllister, David Batty, Tony Dorigo, Eric Cantona. Inset: Guido Buchwald, Michael Frontzeck, Günther Schäfer. 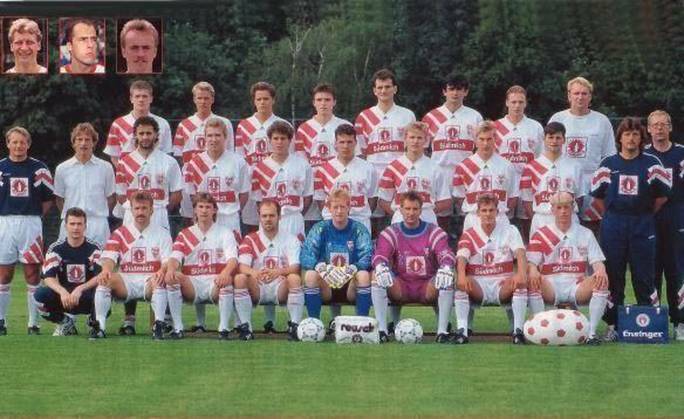 Slobodan Dubajic, Uwe Schneider, (Assistant Coach). Gerhard Wörn (Physio), Jochen Seitz (Kit Manager). 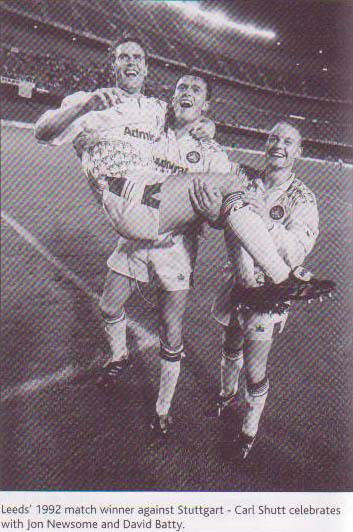 Carl Shutt, Eric Cantona, Mick Hennigan (Coach).